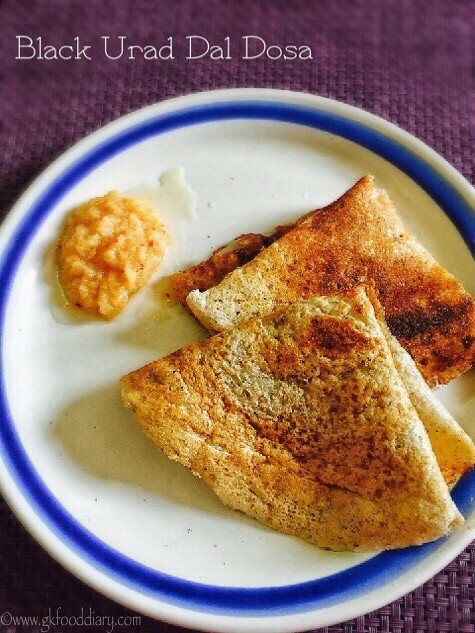 Whole Black Gram Dosa/Black Urad Dal Dosa/Mulu Ulundhu Dosai – one of the healthy wholesome breakfast and staple recipe in my native. Urad dal is rich in calcium, iron and folic acid which is especially important for girl child and women. I have grown up eating urad dal at least once in a week in the form of urad dal porridge, urad dal rice, urad dal halwa or this urad dal dosa. 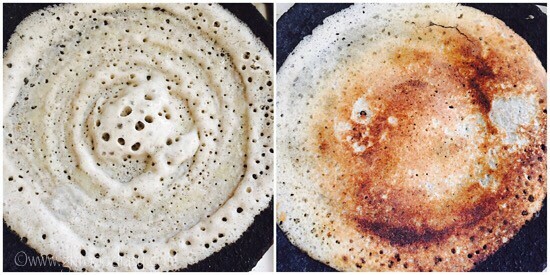 The only difference between regular dosa to this dosa is the whole black urad dal with skin. 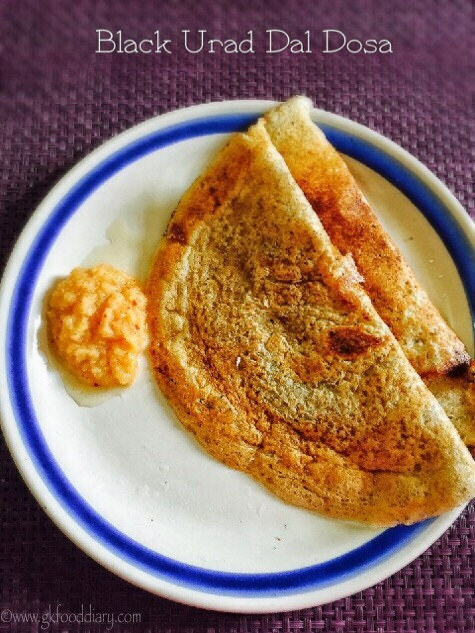 This dosa’s tastes different from regular dosas and pairs well with small onion chutney. It stays soft even for hours. This whole black gram dosa can be given to babies from 10 months with curd once the baby started eating all family foods. Now let’s get on to check how to make whole black gram dosa recipe for babies, toddlers and kids. 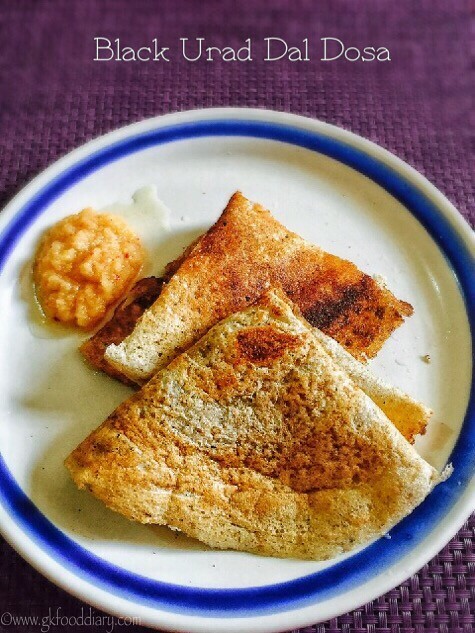 Black Gram Dosa- fermented black gram dosa preparation using mixie. 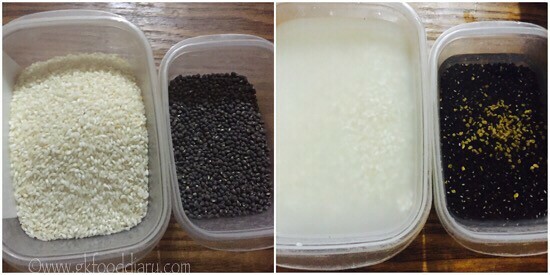 Wash and soak rice and black gram with fenugreek seeds separately for three hours at least. Start grinding the black urad dal with fenugreek seeds first by adding little water in frequent intervals. When the bubbles starts to appear and the batter is fluffy, it's done. Then transfer the urad dal batter to a separate vessel. Then filter the water completely from soaked Idli rice and grind by adding water little by little. Grind it till smooth. Transfer the rice batter to the same vessel where urad dal batter is transferred and add required salt. Mix well with your hands. Let it ferment for overnight or at least eight hours. Next day the batter should be raised as shown (right hand side image). For making dosa's, Heat a tawa, spread the dosa thin in circular motion. Cook it for 2 minutes. Once done flip the dosa and cook it for a minute. Remove from the pan once done. 1. 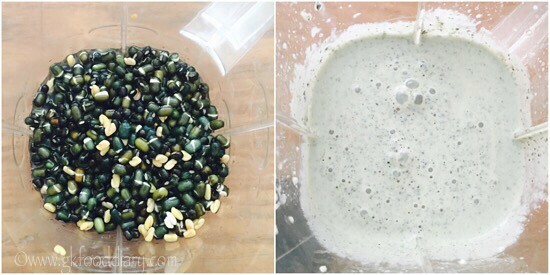 Start grinding the black urad dal with fenugreek seeds first by adding little water in frequent intervals. When the bubbles starts to appear and the batter is fluffy, it’s done. Then transfer the urad dal batter to a separate vessel. 2. Then filter the water completely from soaked Idli rice and grind by adding water little by little. Grind it till smooth. 3. Transfer the rice batter to the same vessel where urad dal batter is transferred and add required salt. Mix well with your hands. Let it ferment for overnight or at least eight hours. 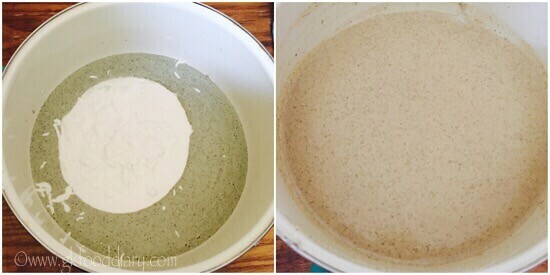 Next day the batter should be raised as shown (right hand side image). 4. For making dosa’s ,Heat a tawa, spread the dosa thin in circular motion. Cook it for 2 minutes. Once done flip the dosa and cook it for a minute. Remove from the pan once done. Serve the whole black gram dosa with curd, chutney or Sambar of your choice. The batter will be little watery after grinding as we are using mixie. Next day after fermentation, it should be okay. Use cold water to grind in order to avoid the motor heating. 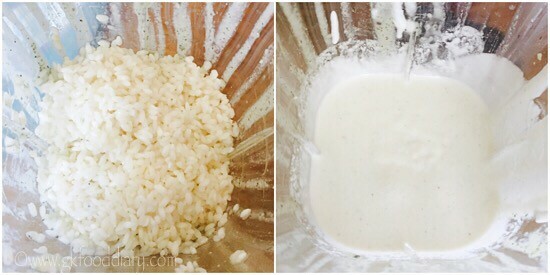 Always use hands to mix the batter that helps in better fermentation. Fermentation time will be more if you are living in a cold country. You could make this dosa’s thin or thick as per your preference, in both the ways it tastes good. 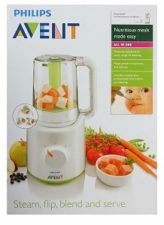 Always check with your pediatrician before giving any new food.